When I was a young kid back in the Philippines, I always look forward to fiesta season when the carnival comes to town with various rides and shows. The centerpiece of the carnival was the ferris wheel and I never missed a ride despite the funny feeling on my stomach when the gondola comes down. So when I visited London last year, I made sure to ride their landmark ferris wheel called the London Eye. The ride was much slower taking 30 minutes for a full turn and was intentionally built as an observatory to provide visitors a bird’s eye view of the city. I took this photograph a day before I took the ride while exploring my hotel’s neighborhood. I also booked the champagne experience package to skip the lines and for a less crowded gondola and synchronized my ride with the time of the sunset. Unless one is scared of heights, every visitor to London should ride the London Eye where the view of the city is just breathtaking. The Stonehenge was created by a culture that did not leave any written record so every assumption about this ancient structure is debatable. During my visit to this famous site, our tour guide mentioned that this was once the site of musical concerts…made me wonder how many seasons of Stonehenge Idol ran on this site. 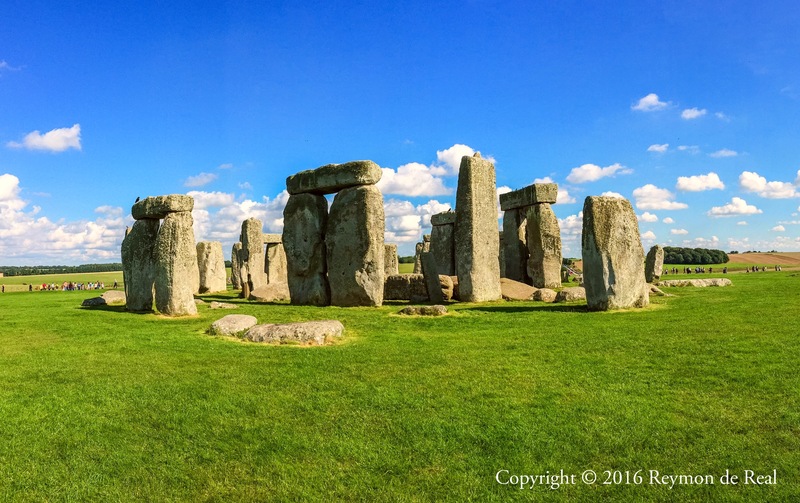 People also say that a visit to Stonehenge is like taking a spiritual trip…however in my case, it was more of a photo opportunity trip. The site is surrounded by a cordoned pathway to prevent visitors from touching the rocks and this photo was taken at the section closest to the ruins. Seriously though, I did feel a strong force of energy and an unexplained sense of joy while walking around this site. This has been on my bucket list for a long time and I am certainly very glad to finally write it off. While exploring London’s Piccadilly area after an afternoon tea at the Browns Hotel and a little shopping at Fortnum & Mason, I noticed this interesting art exhibition featured in the middle of this huge courtyard. Apparently, I have stepped into the Royal Academy of Arts complex. The RA is an art institution focused on the creation, enjoyment and exhibition of visual arts. Unfortunately, I had a show (Miss Saigon) to catch so I decided not to get inside the museum. This photo is my sole reminder that I was once in the Royal Academy of Arts complex. Every summer, Queen Elizabeth open the doors of the Buckingham Palace to the public while she takes a vacation in Scotland. My recent trip to London a few weeks ago made a visit to the palace inevitable. Photography is not allowed inside the palace so people were limited to taking photos of the facade (just like every other tourist outside the palace gates the rest of the year). After the tour, I stepped out of the palace into the backyard and realized that this part of the palace is rarely photographed. Maybe because you will need to be inside the compound to capture this scenery. In this photo, I love how the cotton candy clouds float on the deep blue skies while the expansive carpet of greens complemented the earthy tones of the palace walls. At first look, you wouldn’t even think of this as the Buckingham Palace. It’s nice to capture the least photographed part of one of the most photographed buildings in the world. These panoramic photos of Piccadilly Circus were taken on my way to watch Miss Saigon at the Prince Edward Theatre after having tea at The Browns Hotel. It was raining at most times that day and this was one of those moments when the skies cleared for an hour or two. Piccadilly Circus is London’s version of New York’s Time Square with the theatre district around the same area as well. 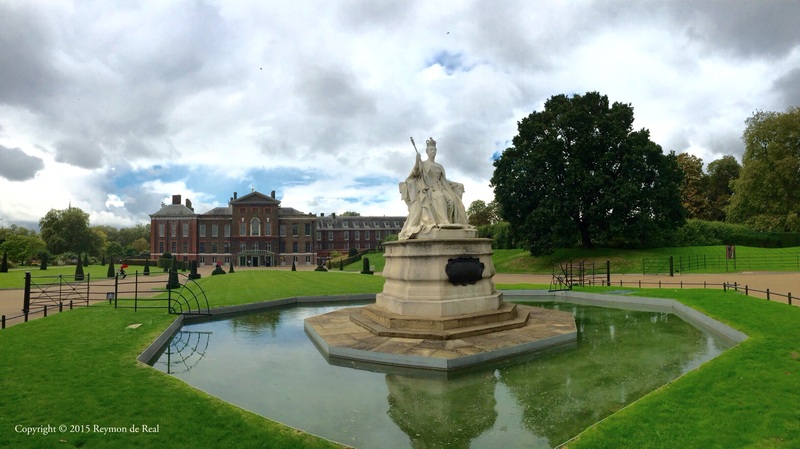 The Kensington Palace in London is one of the official residences of the British Royal Family since the 17th century. Prince Charles and Princess Diana called this their home after their wedding in 1981 and Diana continued to live here after their divorce until her death in 1997. Today their son Prince William lives here with his family. A section of the palace is opened to the public so I took the opportunity to visit this royal home during my trip to London recently. In this photo, you see the statue of Queen Victoria fronting the palace beckoning visitors into her once palatial home. A panoramic view of the Tower Bridge, London City Hall and The Shard taken from the Tower of London side of the River Thames. Unfortunately, it was the wrong time of the day to take this photo with the sun glaring into my camera. However, I tried to be optimistic about it and went ahead to take photos and this turned out not too bad. 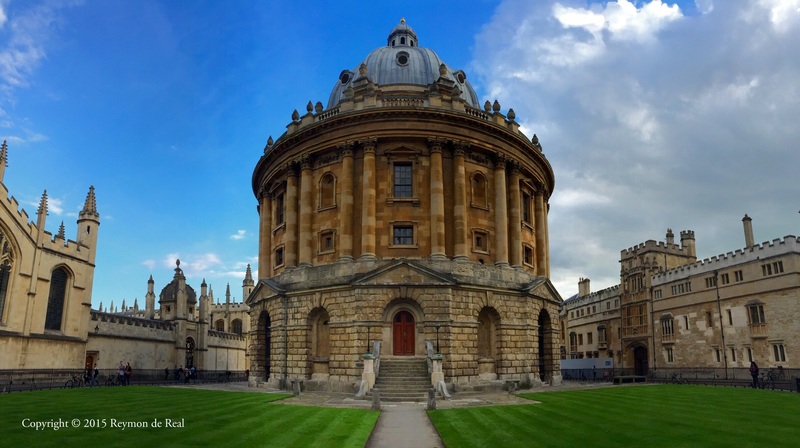 This photo was taken at the Radcliffe Square inside the campus of Oxford University. This trip to Oxford was part of a day tour which included the Windsor Castle and the Stonehenge. I can’t imagine studying in such a prestigious university add to that a beautiful and historical campus. I think my brains won’t last a week here. LOL! A panoramic view of the Palace of Westminster and the Elizabeth Tower, which houses the Big Ben. I used my iPhone 6 to take this photo using the panorama mode in order to also capture the iconic London double decker red bus crossing the Westminster Bridge.